We assess individuals in order to determine their knowledge with regard to reading, writing and mathematical abilities. These placement assessments allow us to tailor a course best suited to their needs, to ensure that they receive the most benefit out of the courses. It is vitally important to have placement assessments done before booking staff members on any particular course. An accurate appraisal will ensure that each learner is presented with course material that they can understand. This material should ideally pick up from where they left off in terms of previous education. Many organisations embark on training for the sake of compliance with the skills development element of the B-BBEE scorecard. This often results in failed attempts at employee development because employees are randomly chosen for the training project. Conducting a learner assessment is, therefore, an important step in the skills development process. At Triple E Training we make sure that your employees actually need training, and which level of training bests suits the individual before we embark on the training project. Assessments are also carried out on tutors on a regular basis to ensure and maintain high standards of teaching. Placement Assessments are done onsite (at your company) and at the convenience of the employer. This means that when your employees are being assessed, your operations will not be overly disrupted. Our learner assessment determines the current skills and abilities of the employees and allows them to be placed on the correct AET level within the General Education and Training (GET) band. It is a pen and paper assessment. The results indicate the pace at which the employee can be expected to learn. 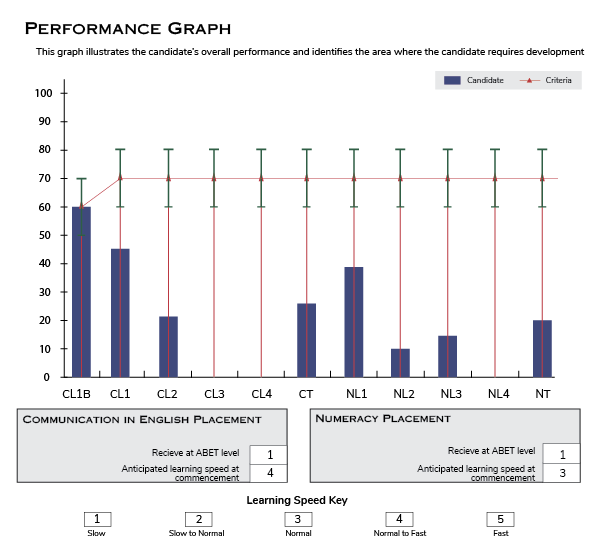 Below are two examples of individual performance graphs drawn up from the results of the placement assessment. 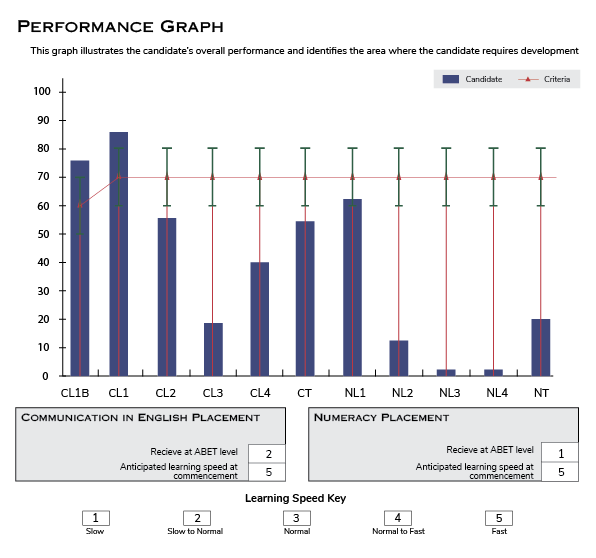 The first candidate scored a placement equivalent to AET 1 Communication in English, whilst the second candidate achieved AET level 2. Both candidates scored an AET level 1 in Numeracy. The unique nature of our adult education and training system means that both candidates, plus any others who were simultaneously assessed, will attend AET lessons in the same classroom. However, the facilitator who has copies of their performance graphs will train each candidate at their individual level. The first step in finding the right facilitator or trainer to assist your workforce in attaining skills in literacy and numeracy is to have them assessed. An assessment will provide the facilitator with the information they need in order to start addressing the education needs of your employees.